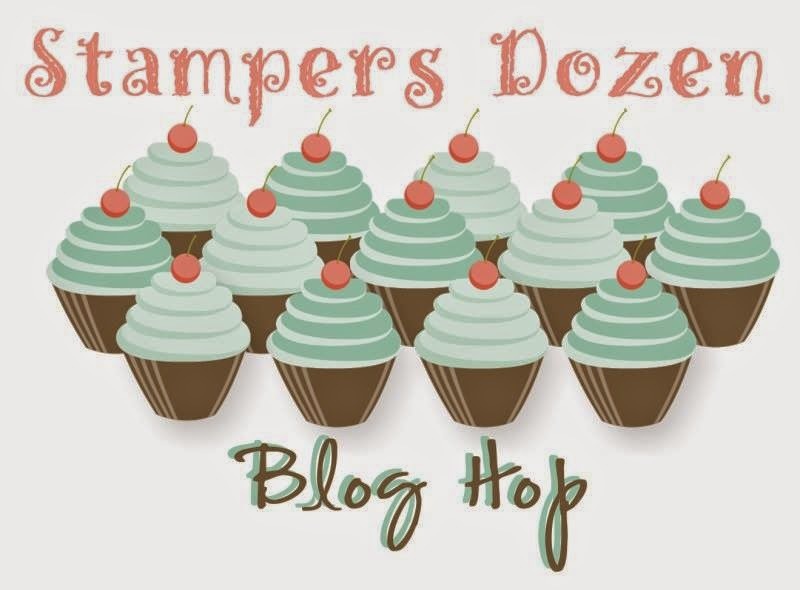 Stamper’s Dozen Blog Hop – Let’s Sale-A-Brate! Cue the confetti – it’s time for a SALE_A-BRATION!!! It’s that time in the Stampin’ UP! year where you get to earn FREE stuff just for ordering stuff you knew you were going to get anyway! And, who doesn’t love a little FREE stuff coming their way every now and again? Not this gal, that’s for sure! So, the theme of the Stamper’s Dozen Blog Hop for this month is all about the SALE-A-BRATION catalog. It’s truly the best thing since sliced bread in the Stampin’ Up world right now… and as you hop through the blogs here, you will soon see why! In fact, I love the items in the catalog so much.. I used two of them on the card I have to show you! 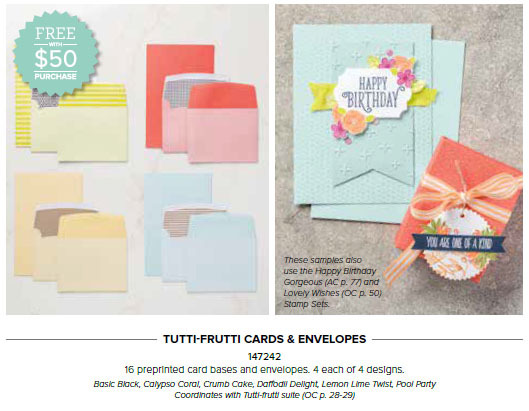 I used the Lots of Lavender Photopolymer Stamp Set (147194) along with the Tutti-Frutti Cards & Envelopes (147242). 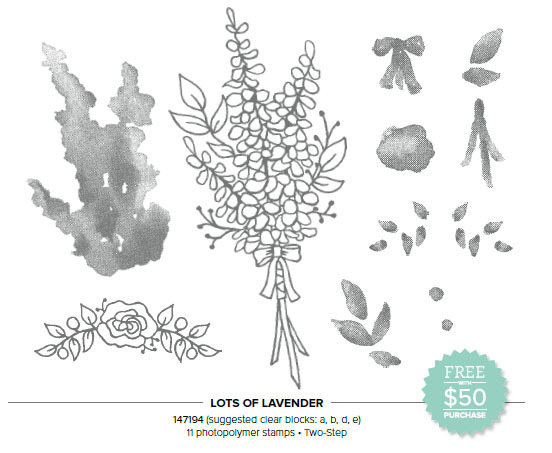 The stamp set is a multi-step image meaning that you stamp the outline of the flowers then you can “color” them in with the other images in the set. And, I may add.. they definitely do not need to be stamped in LAVENDER as the name suggests. There are tons of other colors that they would be happy being stamped in… as you will see below! And, let’s talk about the Cards and Envelops… how great are those? They come in four awesome colors and will coordinate with the other 46 colors in the Stampin’ UP! rainbow. A plain and simple card, perfect for any occasion. I stamped the outline in Old Olive the leaves and stems in Pear Pizzazz, the bow in Calypso Coral, and the flowers in Daffodil Delight. The card base is Daffodil Delight as is the scallop oval behind the image. The strip of green is Pear Pizzazz. I added a tag stamped in Calypso Coral as well as a layer of Daffodil Delight and Calypso Coral behind the sentiment that was tied on with some Linen Thread. Oh, what the heck… here is a project sheet for it! You can earn one of these SALE-A-BRATION items with a $50 purchase, or get them both for a $100 purchase. Wonder what everyone did? Me too! < Previous RemARKably Created Blog Hop: Bundled Up! 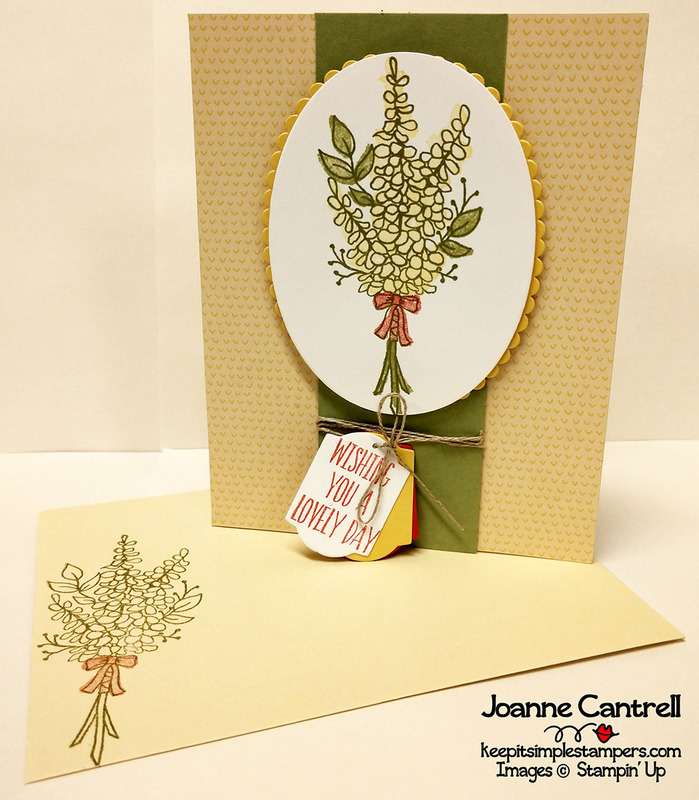 Beautiful card…thank you for sharing the card and the instructions!